Margaret “Maggie” Lounsbury’s life changes in the blink of an eye, and she is left to care for her younger sister. Rejected by various relatives, she ends up living and working with her elderly grandmother. The incident leaves her bitter and mistrusting of God and others. 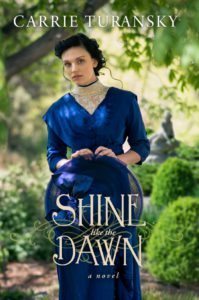 Shine Like the Dawn uses realistic dialogue and well-researched description to effectively evoke Edwardian England. Unfamiliar with the time period, I learned quite a bit about the developing technology of the early 1900s and its impact on the cultural and social mores of the era. I related to Maggie and her childhood friend, Nate Harcourt, who tried to reconcile their knowledge of God to their everyday struggles. The story moves at a steady pace, and I enjoyed the small element of mystery included. I received Shine Like the Dawn for free from Celebrate Lit. I was not required to provide a favorable review, and all opinions expressed are my own. Hi Linda, thank you for featuring Shine Like the Dawn on your blog today! I'm excited to see this story go out, and I appreciate you helping me connect with new reading friends. Blessings to you! It's my pleasure to feature your book. Thanks for stopping by my blog. 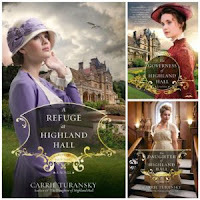 Linda, thank you for sharing about Carrie's newest release!